BOSTON – What if you were gifted with a talent or skill that made you rich and famous, but far from happy? And how would you feel if you used that talent to kill a man? That was the Emile Griffith story: A champion boxer who, despite six titles, was best known for killing a man in the ring. 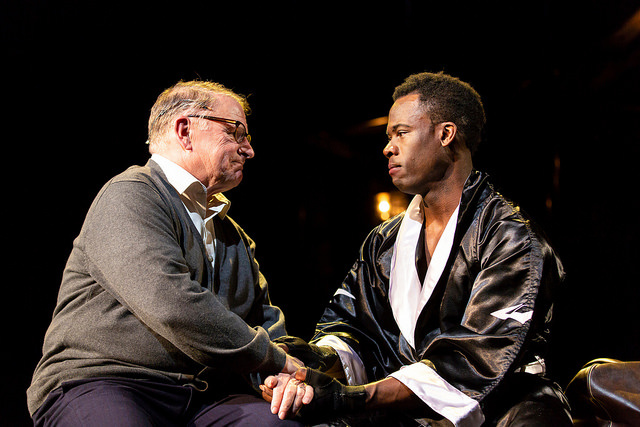 The rise and fall of Griffith, who died in 2013 broke and addled, packs a powerful punch in the Huntington Theatre Company’s production of Michael Christofer’s “Man in the Ring,” smartly directed by Michael Greif. The brutality of the boxing scenes and the tenor of the piece are leavened by the touching relationship between Luis (Victor Almanzar), Griffith’s longtime lover, companion and caretaker and the older Emile (John Douglas Thompson), who is in his final days is suffering from dementia, needs help getting dressed and is seeing things that aren’t there. At times that means his younger self, the chiseled, handsome young Emile (Kyle Vincent Terry). The story begins as Emile prepares to meet the son of the man he killed in the ring, and then moves skillfully back and forth back in time, never losing the thread of the narrative. The young Emile arrives in New York City from St. Thomas in the Virgin Islands with a baseball bat and a smile, ready to make his living as a baseball player or a singer, or, in a pinch – as a designer of ladies’ hats, much to the amazement of Howie Albert (Gordon Clapp). He is the manager who steers him away from the garment business and into prizefighting, a gruff but loving and protective type akin to Burgess Meredith’s Mickey in the “Rocky” series. Emile has a complicated relationship with his mother Emelda (Starla Benford), who abandoned her large brood of children to relatives on St. Thomas to find work in New York. He reunites with her in the city, but Griffith’s own unhappiness plays itself out in his relationship with his mother. And while Griffith was a gallant warrior as a fighter, he was always conflicted about his bisexuality, and whether taunting about his sexuality he endured from Benny “Kid” Paret before their fight, which might have led the to the brutal beating Griffith administered to Paret (played by Sean Boyce Johnson) that fateful night of March 24, 1962 at Madison Square Garden. Griffith unleashed a fateful torrent of punches before Paret collapsed, lapsed into a coma and died 10 days later. When Paret died, a great part of Griffith died with him. Christofer also portrays the brutal beating outside a gay bar in 1992 that nearly killed the boxer. As someone who has watched or reported on hundreds of professional fights, hats off to Richard Gatta, Dave Heard and Michael Underhill portraying the ring announcers; Rick Sordelet and Christian Kelly-Sordelet for designing the fight choreography; the projection design by Peter Nigrini and Dan Scully; and the use of actual fight footage to tell the story a tortured soul caught up in the most brutal of sports. Plays about sporting figures often run aground in their portrayal of the actual athletic exploits, but the Huntington’s superb team of designers are on it big-time. David Zinn’s set is in shadows when it portrays the darkness of Griffith’s later years, but it springs to vivid life on a rotating platform for the fight scenes as Griffith recalls his triumphs and losses. Ben Stanton’s lighting creates explosions of lights to burn the images of the fighters on our brains. There is another aspect of the production that adds immeasurably to its success, and that’s the Caribbean-flavored music and children’s circle songs that establish and burnish Griffith’s Virgin Islands heritage. The music direction, arrangements and incidental music are all by Michael McElroy, with the music skillfully performed by guitarist Max Kennedy and percussionist Austin Birdy. The sharp pacing by Greif keeps the story moving apace, and the ensemble – led by Thompson – is strong across the board. 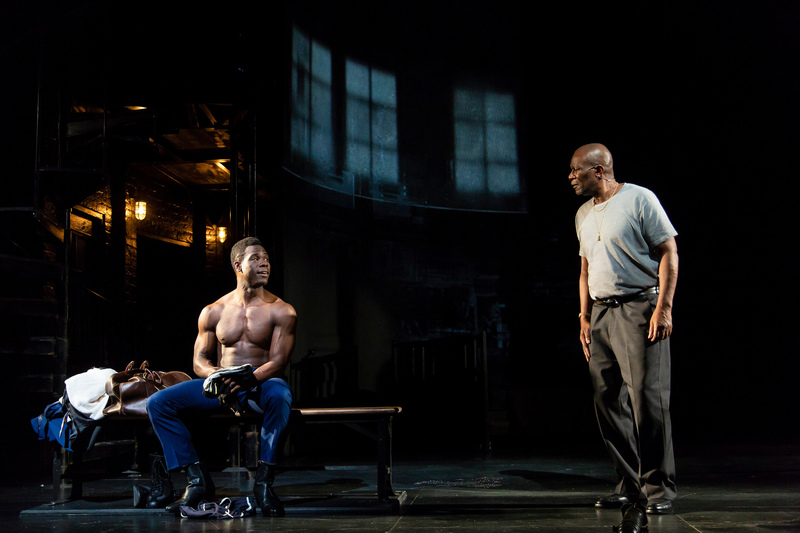 “Man in the Ring” is moving, powerful, handsomely presented and skillfully acted and directed. You don’t have to be a boxing fan – simply a fan of a great story told well – to appreciate its charms. The Huntington Theatre Company production of Michael Christopher’s “Man in the Ring.” Directed by Michael Grief. At the Wimberly Theatre of the Calderwood Pavilion in the Boston Center for the Arts through Dec. 22. huntingtontheatre.org.